Arts facilities serve a unique place on college campuses. They are learning spaces where students study and practice their creative crafts—dance and music to theater and visual arts. Yet arts facilities are also campus-wide gathering places, where the community comes to hear a student music recital in a concert hall or view a student exhibit in a gallery. Arts facilities place the curriculum on display, sharing with the entire campus. Access to modern, updated arts facilities is essential to a successful learning experience—for both the arts students and larger campus student body. Yet arts facilities face many challenges—and opportunities—today, with aging facilities, changing student demographics, evolving curriculums, and shrinking budgets. 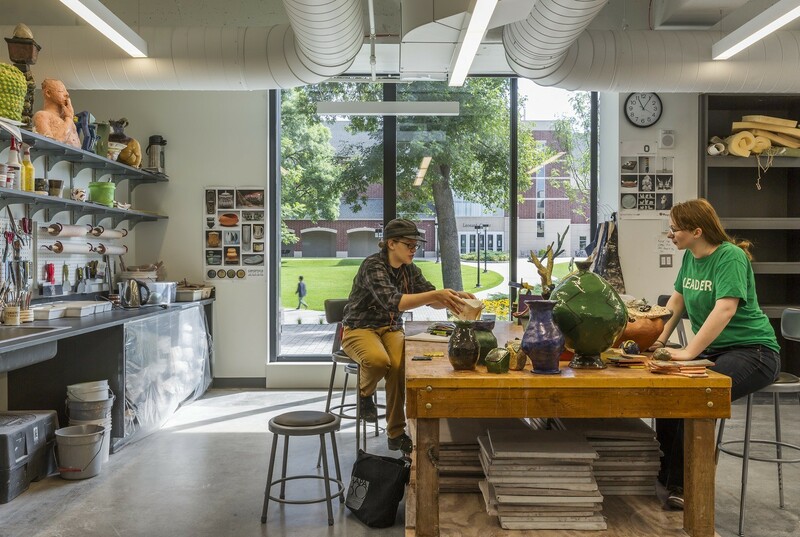 To remain viable, arts departments are thinking creatively about their evolving place on campus, reimaging arts facilities as incubators for new approaches to the creative arts and campus culture. While all arts facilities share basic architectural requirements specific to their programs, they also stand at the forefront of broader social changes unfolding on campus. Arts facilities can help shape those changes and inspire students. When planning a new or renovated arts facility, many campus leaders are looking beyond curriculum to broader conversations happening across campus and across the nation. The following conversation-starters can inspire how campus leadership approaches the planning process, cuing them into the social dynamics transforming campus culture. College campuses have long been places to nurture the whole student—body, mind, and spirit. Yet recent studies indicate that students are experiencing greater anxiety today than in the past. The reasons may be varied—and the solutions even more varied—but student wellbeing is gaining importance among college administrators. Although related to wellness and health, wellbeing holistically promotes a “state of being comfortable, healthy, or happy,” according to Merriam-Webster. Wellbeing impacts learning and related activities that inspire achievement. Applied to the college campus, student wellbeing considers how the built environment, curriculum, social activities, sense of community, safety, and connection to a greater cause all contribute to a positive student experience. As student bodies grow more diverse, campuses are looking for ways to create meaningful experiences for all students. While race, gender, ethnicity, and religion often define demographic diversity, campuses must also consider differences in life experiences, individual goals, personal identity, and global outlooks. As student bodies change, campuses must balance these changes with a need to create an authentic experience that gives diversity space while creating a sense of campus unity—a shared experience. The arts are certainly one of the best opportunities to express different perspectives. Arts facilities themselves can be places that redefine diversity—and community. Student diversity also is informing changes in curriculum, with new ways of expressing visual arts, music, dance, and theater. Students are bringing their life circumstance to the arts. Through changes in curriculum, the arts are becoming an even stronger forum to expose students to ideas that they may never have thought of before—to share experiences with each other in new and exciting ways. The arts are always living, never static. Curriculum will continue to evolve to express the continuously evolving, global nature of the arts. The arts traditionally have been part of a broader social dialogue that celebrates all aspect of society. While holding a unique opportunity to bring people together across disciplines, the arts generally have existed isolated from the main campus life. That is changing. More and more campuses are building facilities at strategically visible locations, bringing the arts to the forefront with spaces that attract campus-wide audiences. And better yet, arts departments are exploring new opportunities for multidisciplinary collaborations—from its close cousins in the Humanities to new relationships with STEM—through common spaces shared by both science and arts students. The rigor and precision of math and science lend themselves well to the rigor and precision of music and dance and painting. Music is, after all, mathematically precise. Multidisciplinary collaboration exposes students to new ideas, perhaps inspiring fresh insight from seemingly unlikely sources. The arts present a unique opportunity to promote multidisciplinary learning. Necessarily, curriculum-specific programming often dictates how spaces are designed. Music requires acoustical isolation for practice. Dance requires proper floor surfaces to enhance movement and prevent injury. Theater calls for professional-level backstage equipment and safety codes. Visual arts need ventilation to prevent illness. Yet beyond the prescriptive, planning strategies that holistically embrace all students help inspire learning and creatively. When planning new facilities, consider how wellbeing, diversity, evolving curriculum, and multidisciplinary collaboration may shape your planning. Consider how spaces can bring people together, generate fresh insights, encourage conversation, and enrich the entire campus. Successful arts facilities promote continuous dialogue with students, campus, and community—now and into the future.